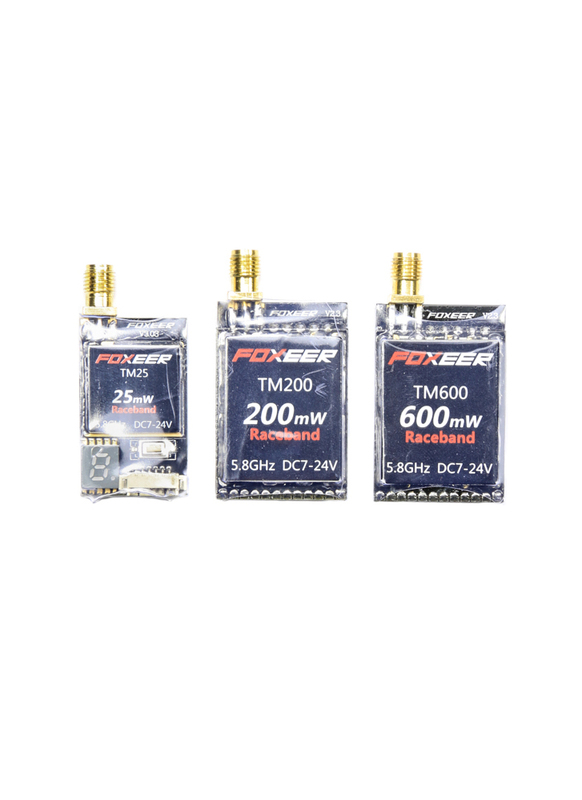 Foxeer’s TM series video transmitters have been designed with the FPV racer in mind. They are super compact, lightweight, support RaceBand frequencies and have a 5v regulated power output for a FPV camera like the Foxeer HS1177. TM25: This is a UK legal transmitter, it’s 25mW power output and 27 channels are free to use in the UK without a license. Although you have probably seen more powerful FPV transmitters, don't think it has a poor range because of its low power rating. With the stock antenna you can get 200m in open space. However, if you are using some circular polarised antennas, you can easily get >300m. Low power FPV transmitters are also really good for indoor environments, where high-powered transmitter often cause multipathing (poor signal quality caused by the signal being reflected by obstacles). TM200: 200mW is a power output used by a lot of FPV mini quad racers. It's enough to provide a decent range and reception and equally won't kibosh everyone else’s fun, or eat into your battery life. TM600: This transmitter certainly packs the power; 600mW is enough for 1km+ LOS long-range flights. All of the transmitters operate across multiple frequencies and channel bands, making them compatible with most FPV gear on the market including Fatshark and ImmersionRC gear. Best still, there’s not a dipswitch in sight, it has a channel selection button and LED display that makes changing channels a painless experience. All of the models have offer a SMA or RP-SMA connection option, to suit different antennas without requiring an adapter - please check which you need before ordering. Please note that the transmitters do not come with an antenna - we recommend using the Skyzone circular polarised FPV antenna. IMPORTANT: Do not turn the transmitter on before attaching the antenna, doing so will permanently damage the board! Note: Please check with your local authorities regarding the operation of this equipment before you purchase. Regulations on power output, usable frequencies and licenses’ to operate vary from region to region. Quick Channel Switch - Abandon traditional DIP, adopt key LED display, visual operation, more convenient. SMA (Left) / RP-SMA (Middle) / Pigtail Version (Right) Sold Here. FPV equipment and advice: If you like multicopters, you are more than likely going to like FPV flying. Most people dream of piloting an aircraft for real, well with an FPV setup you can actually place yourself in the cockpit (well sort off)! FPV stands for First Person View – it’s achieved by mounting a camera on your multirotor and broadcasting a live video feed so that the pilot on the ground sees the flight from the aircraft’s view. When it comes to selecting FPV TX / RX equipment you will soon discover that there is a huge selection to choose from. However, a word of warning; not all of it will be legal to operate in the UK. Only certain frequencies are freely available to use and furthermore there are constraints on transmission power levels. 2.4Ghz video equipment is legal, however most radio control equipment utilizes the 2.4Ghz spectrum and consequently when used together there will be interference. This leaves only one credible option, the 5.8Ghz band, which incidentally is a very clean band due to the low amount of other users. The drawback is its poor penetrative ability; buildings and even trees can have an adverse effect on the signal strength. This means it’s advisable to use it for line of sight (LOS) flying only. This brings us onto power constraints. In the UK, you are limited 10mw of transmission power on 2.4Ghz and 25mw on 5.8Ghz. Contrary to popular belief, an amateur radio license (HAM) does not exempt you from the power restrictions for airborne use. While you may have seen transmitters with higher power ratings - 200mw is popular, these are not legal to operate in the UK for FPV. You might be wondering why the power level matters anyway? Well, more power gives greater range. However, it’s not that simple; to double the range you have to quadruple the power! Therefore simply buying a very powerful TX to achieve great range is not an especially effective or legal solution. The best way to achieve greater range is by selecting appropriate antennas. There are a variety of different types; each designed to work slightly differently, for different purposes. Therefore, in order to make the best selection you need to understand how they work. Most transmitters / receivers come with an omnidirectional, 2.14dbi gain “Rubber Duck” antenna as standard. The key terms to understand here are omnidirectional and gain. Omnidirectional refers to the radiation (or received) pattern of the antenna. Gain on the other hand refers to the antenna’s directivity. To better understand, you can make an analogy with different light sources. If you have a light bulb out in the open, the light will go in every direction, but it will not go very far (this is your omnidirectional low gain antenna). If you take that light bulb and put a reflector behind it, the light will be directed more brightly and much further but in a narrower beam (this like a directional high gain antenna). Radio power works in the same way, you will never get "extra" power from an antenna, but you can direct the radio power where you need it, and it will be many times stronger. The best thing about increasing the gain of your receiver antenna is the effect it has on your range. For example, if you were to replace your standard 2.14dbi omni antenna with a 17dbi helical antenna you increased your receiver dbi by ~15dbi. 15dbi divided by 3 gives us 5 times the range you think. Well no, 3dbi gain doubles your distance; another 3dbi on top doubles your new distance. So by increasing the gain from 2dbi to 17dbi actually increases the range by 32x its original distance! All this without increasing the TX power at all! Because high gain directional antennas work by taking power away from some areas, and focusing it in other directions, they need to be aimed, otherwise your multirotor will fly into weak spots and your video link will be lost. Remember that the higher the gain, the narrower the beam of radiation and hence the greater need for precise aiming. If the multirotor is far away from you, aiming will be easy, as its position in the sky will change slowly. If it’s close, it is much harder to keep the antenna aimed. The solution is a diversity system. A diversity receiver has multiple video antennas and automatically chooses which antenna is receiving the best signal at any moment. This allows you to have the best of both worlds; you can have a long range directional antenna that you aim when your multirotor is far away (for example a high gain helical antenna), and also a omnidirectional antenna that only works close, but does not need to be aimed for instance a low gain skew planar wheel antenna). If it are still stuck, then watch this video - it's an excellent layperson's guide to understanding the relationship between range and gain. If you want a more in detailed explanation watch this video - it will help you understand polarization and also select an appropriate antenna.